Its been quite a while since the last post, I’ve been very busy with the usual stuff, I’ll spare you the excuses…. 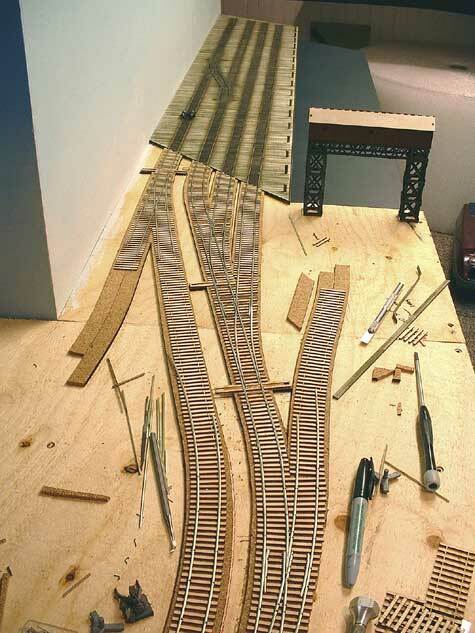 Getting the section with the dock completed is critical to operation, and I have made a pretty good dent in the trackwork leading up to the dock. 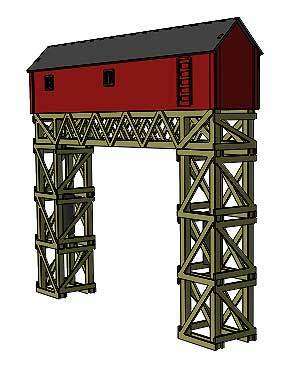 I have also designed and built one of the structures for the apron. I drew this up in 3D and cut it out on the laser. All the parts for this were cut on the laser, even the beams. The cross bracing is a single piece, with nail holes added. Before assembling I “enhanced” the wood grain using a razor saw to scribe in the grain lines. There will be a walkway added under the door, and a ladder assembly added as well. 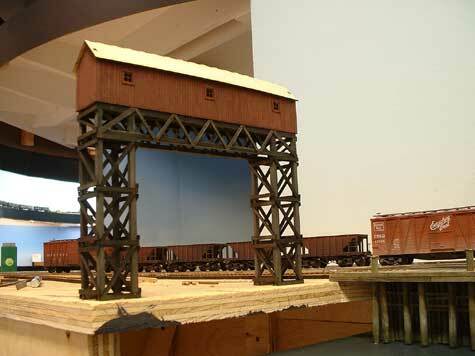 I think I will use some Tichy plastic walkways that I have on hand for this. It still needs a bit of effort to complete. 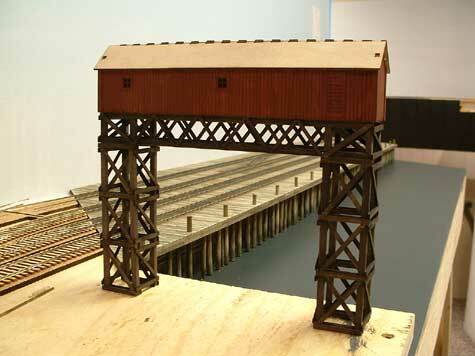 And I also need to add the movable deck for the apron and the pilings and pier for it as well. 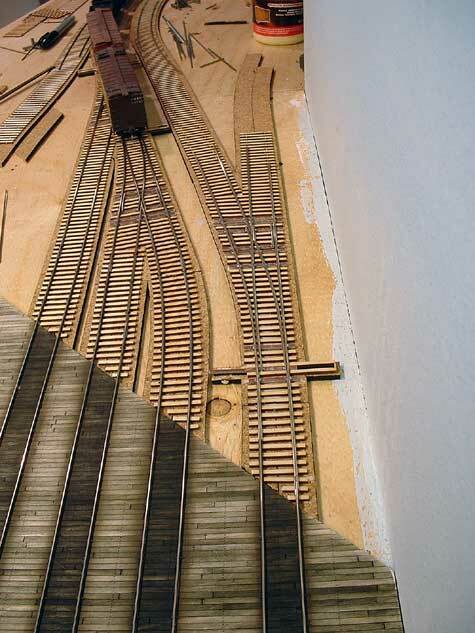 With the dock glued in place and the switch machines for it added, I started on the trackwork leading onto it. I used all #5 turnouts here, as they seemed to fit the best and will operate fine with the equipment I will be using. I built two of them as close together as possible, to squeeze it all in place. The rest of the ties were laid using our upcoming “TwistTies Crossties”, which are flexible crossties similar to the turnout version. These work great, and really speed up construction. The same picture but with the upper turnout in place and all the crossties added. 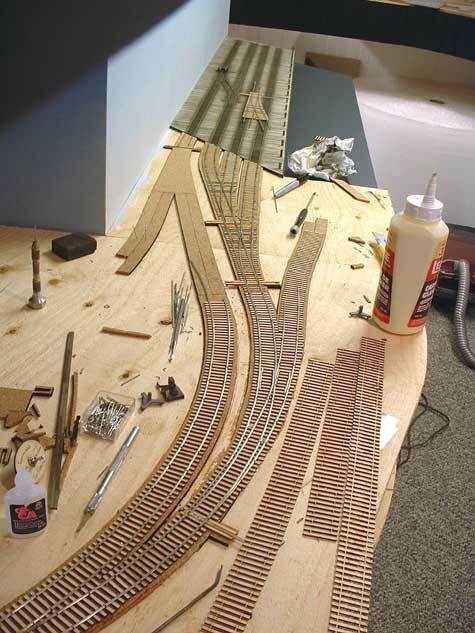 I will add the trackwork leading up to the apron a little later. Just need to add some more switch machines and wire it all up and I can put this section into action! Once this is done I can focus on completing the apron structure and get the water poured.